Well its been somtime ..infact just over 2years since i last posted a picture . I sadly sold my Morvian 2 years passed and have been without a camera untill now . To make matters more intresting i also used a new PC for imaging which i thought had all the correct an up to-date software . But it wasnt untill I got SGP up and going and ready to take a shot it imforms me im using an outdated PHD2 !!!! SO not dithering for this image section . I started taking 2mins subs and then moved up to 5min subs in HA .I was unsure how much time i would get but some how dodged most of the clouds for 2.5 hours. This Picture is 50 mins of 2mins and 1hour 40mins of 5 mins . My stars arnt quite round towards the edges and i put this down to my back focus being 58mm which i hope to sort over the next week . I have stretched the image maybe a little too much for the data ,but over all im very happy with the first light of this camera and am very excited at the potential of this camera. V nice, as for the flats I have been using a load of different settings but the best results I have found a setting of between 12000 and 15000 adu. Although I'm still experimenting as I have been having difficulty in getting a good image just lately. Your shots are great, well done. I have the same camera and use APT which has a Flats Tool to help you get the right flats. It targets an ADU for within the 19000- 21000 range. Above these levels would seem a bit high for mid grey I think. Thanks Dave . I will try out those settings. Great result and a nice match for the scope. I too new to the ASI 1600 and very impressed so far. this is Ha data from the last few clear nights collected with my Canon 300 mm f/4 (ca 20 x 10 min ISO 1600) and 5" refractor (ca 16 x 20 min) sitting side by side, to which I added RGB data from the Canon lens collected in December (76 x 3 min). I also post the 5" refractor image as it is quite detailed. All with my trusted Canon 60D cameras (60Da on the refractor) on my EQ8. Further details can be found on my Astrobin. C & S most welcome of course! Just got a nice surprise! 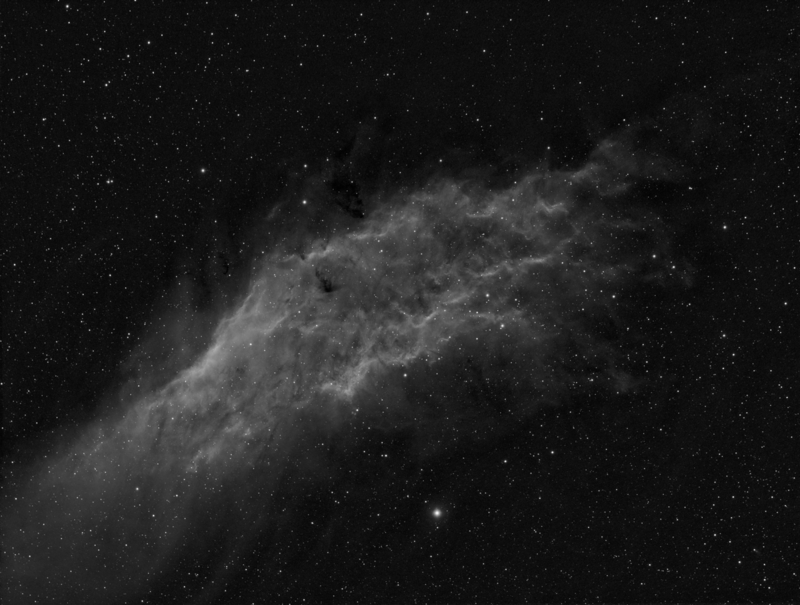 In the plate solving that is automatically done when images are uploaded to Astrobin, I just noticed that in one of my California Nebula images (from 21 Dec 2017), there was also something identified as IC2005. Looking it up it turns out to be a galaxy that is apparently bright enough to shine through the red nebulosity. So, here it is, lurking in the right end of the image (arrow). I also post a crop of the galaxy area (with IC2005 in the centre). I do not know anything about it - wonder if anyone does? The image was taken with my ES 127ED refractor (@ FL 752mm) and a Canon 60Da. 18 x 8 min (so 2.4 hours) at ISO1600. Processed in PS. Not done any deep sky imaging for over 3 years. A few changes in personal circumstances have meant a new lease of life back into the hobby. So here's 80 minutes worth of 10 minute unguided Ha subs using an SX H36 camera through a Tak FSQ106 mounted on a Paramount MX+. Taken on Friday evening when I had to be up early on Saturday to get the train down to London to attend Astrofest. Calibrated the image with some flats, bias and darks taken on Sunday Morning. 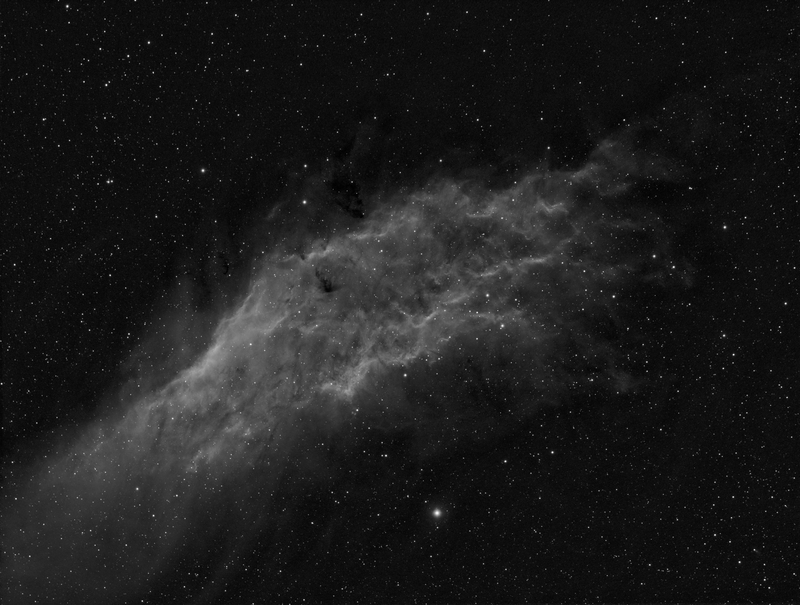 Minimal processing (trying to remember how to use Pixinsight) so stacked in DSS, some basic stretching in PS. I'm happy I'm back in the saddle again. I think I'll try and add some more data to this one before the winters out. This is a two panel mosaic (with central overlap) that has been waiting to get processed - for some reason my first attempt to process it reached a dead end where I was rather disappointed with the results and gave up. But with clouds and moon conspiring I have made a new attempt from scratch. Taken with my Canon 300 mm f/4 (@f/4) on my triple rig on the same night as the previously posted Samyang 135 and ES 127ED images, so 21 Dec 2017. Like my Samyang mosaic, this is an accidental mosaic created by a shift in framing after the meridian flip, resulting in a somewhat unusual framing. Stacked in PI and processed in PS. 76x3min @ ISO1600. This is an accidental mosaic since the framing of the Samyang moved after the meridian flip at midnight (it was sitting on my triple rig and I only adjusted the framing for the large refractor after the flip). I think it was a fortunate move since it allowed me to catch a lot of dark nebulosity above and to the left of NGC 1499 and a cute little nebula called NGC1579. Taken from my garden obsy on the Swedish countryside in Värmland on 21 Dec 2017. Temperature was ca -4°C and SQM 20.9. Camera: Canon EOS 60D (unmodded) at ISO1600.